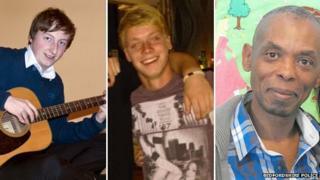 Tributes have been paid to three men killed in a collision with a coach in Bedfordshire. Tom Aldridge, 20, and Nathan Reeves, 23, both from Newport Pagnell, Buckinghamshire, and Allan Evans, 59, from Islington, London died in the crash on the M1 on Saturday. A fourth person, a man in his 20s from Newport Pagnell, remains in hospital. The coach driver was arrested on suspicion of causing death by dangerous driving and bailed. Bedfordshire Police said the double-decker coach collided with the Audi while it was stationary on the hard shoulder near Flitwick at 06:45 GMT. Family and friends have been paying tribute to the three men who died. Mr Aldridge's family described their "beautiful son" as a "generous and loving boy". "Tom would help everyone who needed it and has seen friends through many hard times always putting them first." He had been at a party in London with his friends and was being given a lift back home when the accident happened, they said. Mr Reeves' family said he had "a smile that could melt anyone's heart". "Nathan lived his very short life to the full and my heart is full of love and pride for having this beautiful person as part of my life." Mr Evans was a carer for his elderly mother and was described as "a loving, kind-hearted son, brother, and uncle". In a statement his family said: "He always looked out for others who came into his life and will be sorely missed by his mum, sisters, wider family and friends." Tributes have also appeared on the social networking site Facebook. One friend said of Mr Reeves: "You were such a little terrier on that football pitch. Bombing it up and down the wing and always going after the bigger guy. Fearless!" Another wrote: "RIP Tom Aldridge and Nathan Reeves, two of the nicest most genuine lads!" Others described the accident as "devastating news" and "heartbreaking". No-one in the vehicle was injured.